We’ve been making good use of our subscription to the fabulous Twinkl website recently, and I’ve been meaning to write about it for a while. Our display board in the hall is covered at the moment with (mostly) Autumn themed pieces of work and pictures, as the children have been so busy. We are getting through quite a lot of printer ink as the little ones in particular keep asking for more. It started when I decided to look for some resources for Rabbit and Tiddler to practise their number bonds to ten. Twinkl was the first place we looked, and we found this lovely Rainbow to Ten Display Poster. I printed a colour poster for their bedroom, and then two blank ones for them to colour and complete, which they both enjoyed. They also had fun matching these Number Bonds to 10 on Pumpkins, and Rabbit now points out “pumpkin pairs” whenever she comes across them so it seems to have worked! There are lots of other matching activities on different themes – we might try the snowmen ones next. 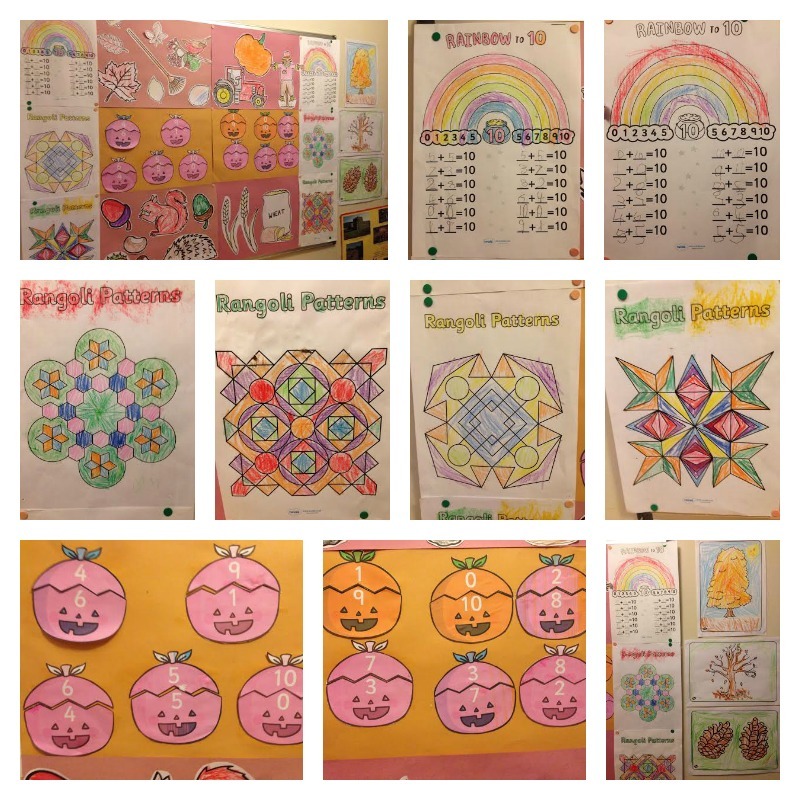 All four children enjoyed colouring the Rangoli patterns for Diwali, and Tiddler in particular kept asking for more, so we printed out lots of Autumn colouring pictures as well. I’m now starting to browse the Twinkl website for some ideas for Winter and Christmas activities and there are so many to choose from that it’s hard to know where with start, but these Winter Maths Challenge Cards might have to be first. This entry was posted in Home education and tagged Autumn, Maths, Number Bonds to Ten, twinkl on November 14, 2014 by Hannah.